There’s a lot of internal medicine sub-specialty rotations you can choose from during your third or fourth year electives, and one that is frequently recommended is cardiology, or electrophysiology cardio (ie: EKG reading), lasting anywhere from 1-4 weeks. It can be one of the most intimidating electives, especially for those of us not interested in becoming cardiologists. Your in-hospital patients will be incredibly sick, your outpatient clinic visits may be emergently transferred to the hospital, and often you’ll spend your early mornings observing cardiac echo’s, stress tests and EKGs being performed. However, it’s a great educational opportunity, and I’ve compiled a massive list of resources, broken up into sections on ACLS, general cardiology and EKGs. You may see some sites listed in multiple sections, and there are no iPhone or Android apps listed, as I never found one I actually wanted to use. If you have one you love, share it in the comments! Keep your ACLS pocket cards in your pocket – you’ll want to be sure they’re on hand. There’s no shame in reviewing your drugs during a code if you’re not needed on compressions. Practical Clinical Skills EKG Training. This site is really the bees knees – they have an intro to EKGs covering all the basics, a nice reference guide, free lectures from EKG Academy, and excellent arrhytmia practice drills. Best of all? A randomly generated 20 question EKG quiz that gives you points based on correctness AND speed, generated from a library of 350 tracings. So, so flippin’ good. Definitely try the arrhytmia practice drills if you have ACLS coming up. For daily EKG Practice/ to improve your skills take a look at the 6 second ECG game, Weekly ECG (has an app, but the website is free) and the intensive but detailed explanations of Wave Maven. Have trouble remembering heart blocks? Here’s a YouTube video that won’t help, much, but may make you laugh. If I left off a favorite website, awesome phone app or excellent YouTube series you think other students could use to improve their cardiology, EKG or ACLS skills please share in the comments. I’ll think you’re super awesome if you do. 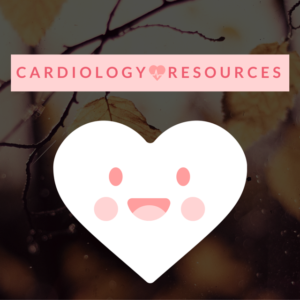 Check out Pixie’s top resources for your cardiology elective rotation!